Back at this year’s E3, Nintendo revealed the new addition of the player having the ability to “boost” while sailing in The Wind Waker HD, though this concept was never elaborated upon. In a recent Miiverse post, director Eiji Aonuma explained this new feature. You may recall a red sail catching your eye in the most recent batch of screenshots for the game, and this of course indicates that your boat is using the new “Swift Sail”. Aonuma explains that this feature not only increases your sailing speed, but also allows you to maintain that speed no matter what direction you traverse in–so you don’t have to constantly change the wind’s direction. You can catch a full explanation from the man after the jump. “The Nintendo Direct video showed a glimpse of the Swift Sail (red sail) that allows the ship to go faster. 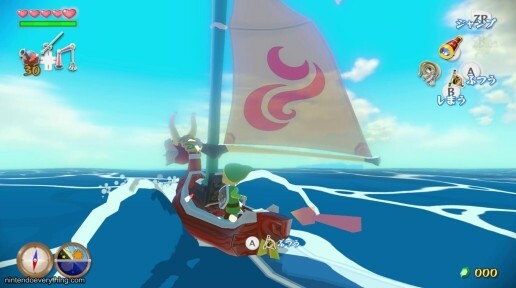 Those of you who played the original may have noticed, but not only will this sail make the ship go faster, but it will always be full of wind, meaning you’re now able to control the ship to any direction you want, without having to use the Wind Waker to change direction of the wind. This is a great idea, as not only does this make sailing a more streamlined experience, it is also optional so that purists need not use it if they want to play just as they did on the GameCube version.